This is outstandingly the Cross of the Soul. The person who is upon the Fixed Cross is becoming increasingly aware of its direction and influences, and does not respond as blindly as others who have not yet mounted this Cross. One does not mount this Cross of Right Direction until they have attained some measure of soul contact and have had some touch of illumination and of spiritual intuitionno matter how fleeting that touch may have been. I am the soul and here I stand. narrow place whereon I stand. I face the light. I am the Light and in that light shall I see Light. It is the Cross whose four energies blend with and transmit the energies of the solar system itself. This it can do because the person upon the Fixed Cross is becoming increasingly conscious of issues which are larger than their own self, more engrossing than their previous interests, and those which concern humanity in its relation to solar forces and not just planetary forces. One is becoming sensitive to the larger whole. The energies of this Cross continue to evoke response until the time of the third initiation, the Tranfiguration. It is called the Fixed Cross because one is stretched upon it by the directed choice and immovable intent of one's Soul. From that decision there is no turning back. 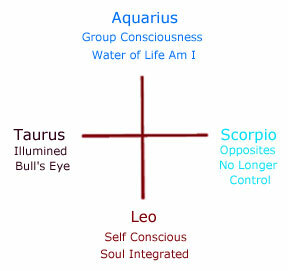 The secret of Taurus is revealed at the second initiation, the Baptism. * At this time one experiences the sudden removal or disappearance of the world of glamour in the blinding energy of light. This constitutes the final radiant activity of the Taurian force upon humanity during the long and cyclic journey to which humanity is committed. The individual enacts on a tiny scale what humanity  as a whole  will enact when it takes initiation in Taurus. *With the second initiation of Baptism in Light, testing and struggle begins on the astral plane as one makes the effort to release the personality from emotional control. The light of reason enters and one continues to shift from the astral (emotional) plane to the mental plane. Self-consciousness begins to give way to group consciousness as the Will of the Soul begins to function. The first contact with Shamballa energy is experienced. The symbol of this stage is the Dove of Peace. When we are talking about the crosses, are we talking about Taurus the sign or Taurus the constellation? They are interchangeable. The constellation empowers the sign.